I am with you on this – the data looks like there has been some price support related to artificially depressed levels of distressed inventory. Will investors take quick gains and get back in the mix once prices start to dip again due to higher supply? Or will they sit back and wait a bit? I guess it depends on how strong their current return (rental yield) is relative to other income investments. I suspect their yields will slip as pricing for distressed edge higher. From the trenches, In the past 18 months i have handled many more “short-sales” with lenders. The owners haven’t made payment in a year or two but the lender hasn’t foreclosed. So is it a short-sale or a foreclosure in the market data? They are each represented separately on the chart. My point is that they are both considered distress and their lower level of volume has skewed the overall price levels higher. Foreclosure generally sees a much larger discount than a short sale so a market share increase of either/both will provide a drag on aggregate pricing. The fact that more short sales are in the mix than the pre-2010 trend would have predicted means a lower drag on aggregate pricing going forward and that’s a good thing. Lenders are attempting to get short-sale prices vs. foreclosed prices. Might work except lenders still take 4 times longer than owner occupied to close a short-sale so buyers avoid them, thus longer market time , thus lower sales price. 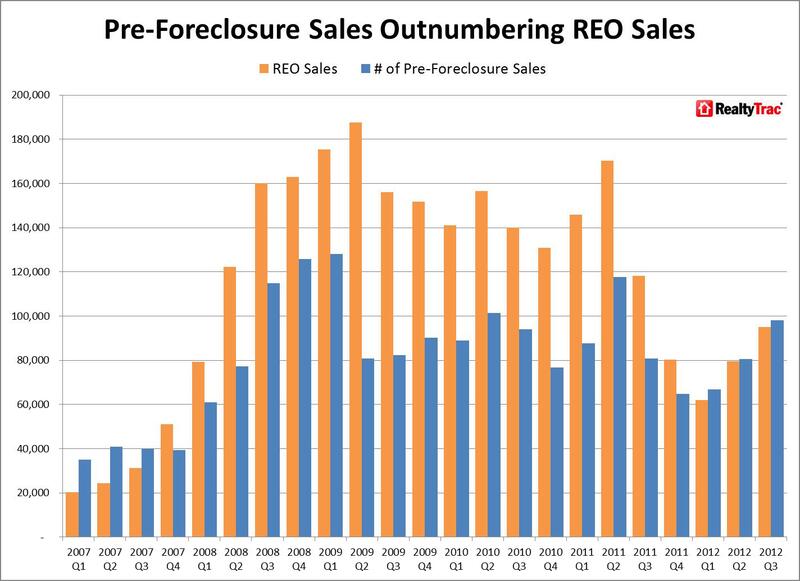 Most important indication on the chart is that distressed property sales have increased each of the last 3 quarters. Increasing even when, seasonly, sales decline. Bingo – thanks for your insights!